Lamy is a small little town outside of the Santa Fe County, New Mexico. It is just south of the city of Santa Fe. The community was named after Archbishop Jean-Baptiste Lamy, and lies within the Bishop John Lamy Spanish Land Grant, which dates back to the eighteenth century. We had actually done a post a while back about the Bishop and his flowers. You can read about it here. The former Atchison, Topeka, and Santa Fe Railroad, now the Burlington Northern Santa Fe, passes through Lamy. This railroad, usually called just the “Santa Fe,” was originally planned to run from Atchison, Kansas, on the Missouri River, to Santa Fe, the capital city of New Mexico, and then points west. However, as the tracks progressed west into New Mexico, the civil engineers in charge realized that the hills surrounding Santa Fe made this impractical. Hence, they built the railway line though Lamy, instead. Later on, a spur line was built from Lamy to Santa Fe, bringing the railroad to Santa Fe at last. In 1896 the Fred Harvey Company built the luxurious El Ortiz Hotel here. Thus Lamy became an important railroad junction. 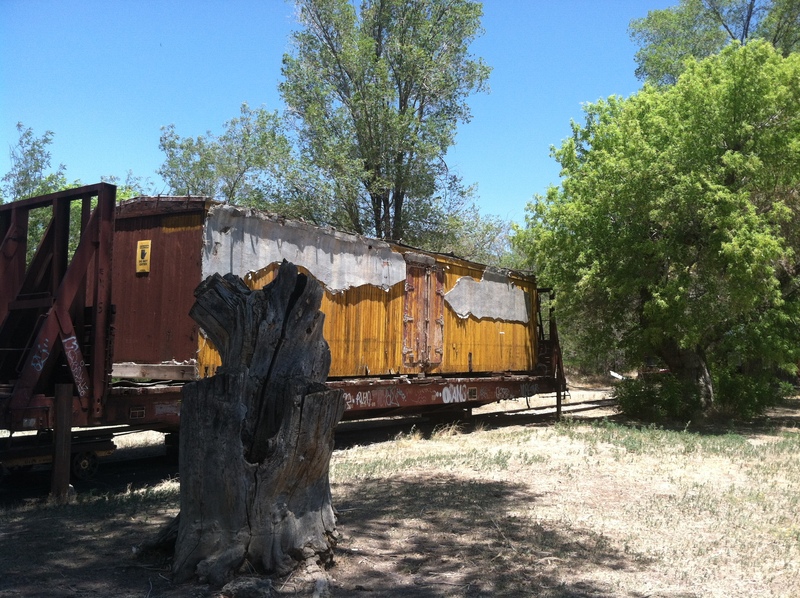 In 1992 the spur line was taken over by the Santa Fe Southern Railway, which operates a popular excursion train, using vintage passenger rail cars and modern freight cars, between Santa Fe and Lamy. The significance of Lamy as a railroad junction is related in the Oscar-nominated documentary, ‘The Day After Trinity’. You can get to Lamy on the Santa Fe Rail Train or you can head out from Santa Fe taking the northbound I-25 to US 285. The exit to Lamy, just east of US 285, is seven miles from the freeway. It is such a beautiful drive and an even better train ride. 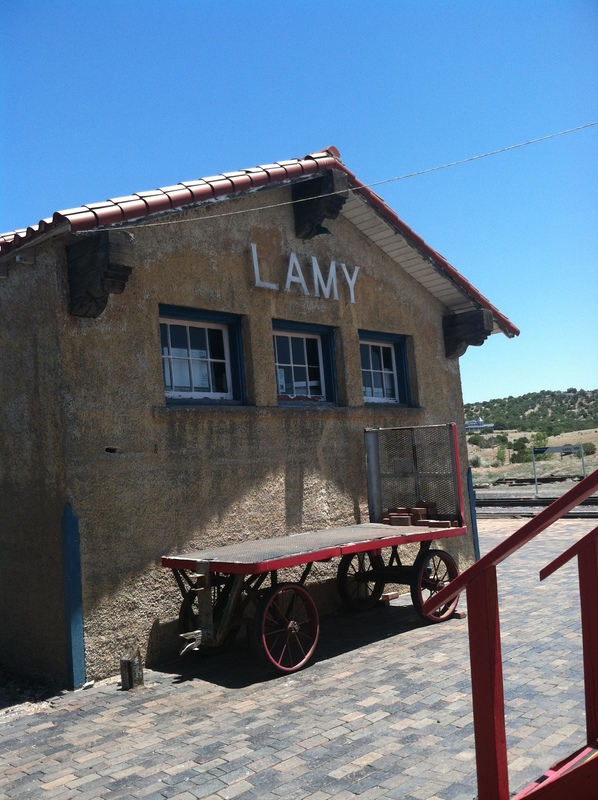 For Father’s Day, we took our family and rode the train from the Santa Fe depot to Lamy and back. We did the Sunday Brunch ride—it takes a little over an hour to ride the train. When arriving in Lamy, we all get off the train and have lunch in their beautiful courtyard filled with picnic tables and surrounded by stunning views. The Cowgirl restaurant, located in Santa Fe did the catering. They provided barbecue beef brisket and chicken, baked beans, corn bread and salad. It truly was a special day. It is so peaceful and quiet out in the small village. There is a broken down car that someone has turned into a house and lives there full time to oversee the village. The house is occupied full time. 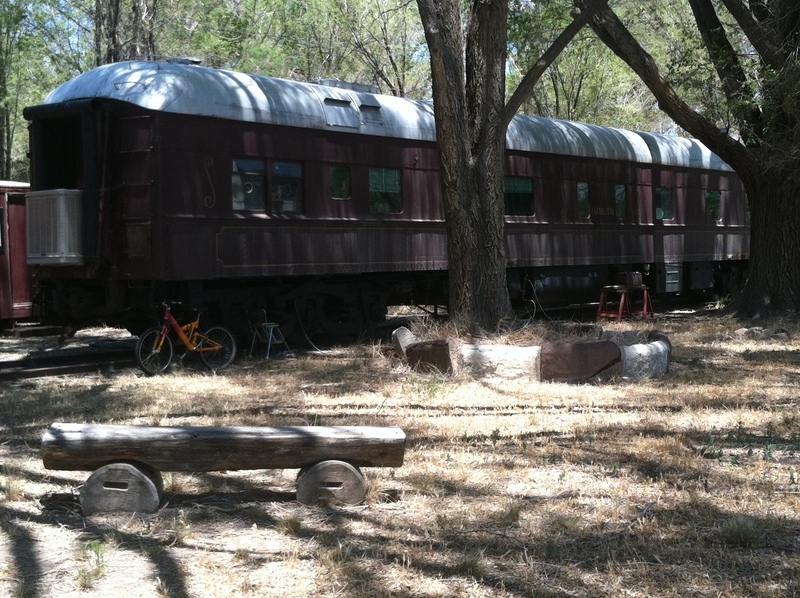 Come to Santa Fe and take a train ride! They have sunset rides, dinner rides, dance parties and much more. We have several vacation rentals that are within close proximity to the railyard district! Contact Adobe Destinations for more information. This entry was posted in Uncategorized and tagged archbishop jean baptiste lamy, cowgirl, el ortiz hotel, fred harvey company, Lamy, NM, oscar nominated, santa fe railyard, the day after trinity, transportation, travel, vacation. Bookmark the permalink.